Study Reading is a course for learners at intermediate level or above who need to develop their reading skills for study purposes. The book is divided into three parts. Part 1 introduces basic reading skills. Part 2 is theme based, with texts from a variety of disciplines, aims to extend the skills introduced in Part 1. Part 3 covers the reading skills required for project, dissertation and thesis work. 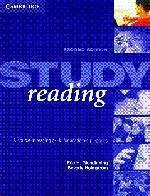 Study reading encourages learners to reflect on their current reading strategies. By doing a variety of task-based problem-solving activities, learners are encouraged to refine their reading strategies through exposure to the ideas of others. The book also gives direct advice on how to improve reading efficiency.